Holds 10 bottles accross the top. 10 Colums accross from side to side. Wine Bottles are positioned as a tile to keep corks wet fr proper storage. 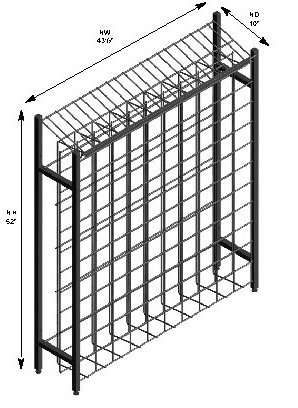 All steel tublar constructed frame with 1 wire shelf accross the top and a wire insert frame in the main portion of the rack.